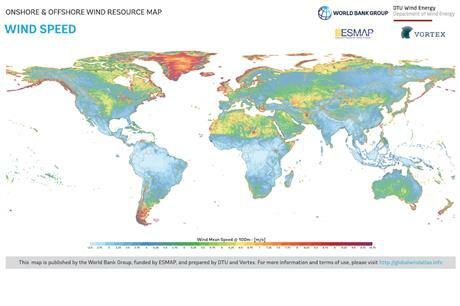 NETHERLANDS: The World Bank and Technical University of Denmark (DTU) have launched a Global Wind Atlas to help policymakers and investors identify promising areas for wind power generation. The project was unveiled at WindEurope’s annual conference in Amsterdam. The partners claim it can fulfil governments’ needs for early-stage wind mapping and enable developers to compare resource potential in different regions. The Global Wind Atlas gathers information from meteorological masts and lidar (light detection and radar) equipment to provide the user with wind climate data with terrain information such as hills or valleys. The map collates this information to illustrate regions’ potential power densities and wind speeds. Riccardo Puliti, senior director and head of the World Bank’s energy and extractives global practice said: "There is great scope in many countries for the clean, low-cost power that wind provides, but they have been hampered by a lack of good data. "By providing high-quality resource data at such a detailed level for free, we hope to mobilise more private investment for accelerating the scale-up of technologies like wind to meet urgent energy needs." The World Bank and DTU concede, however, that the data powering the atlas is not fully validated in many developing countries due to a lack of ground-based measurement data from high-precision met masts and lidars. The Energy Sector Management Assistance Program, a trust fund administered by the World Bank, has funded a series of data collection efforts in countries such as Bangladesh, Ethiopia, Nepal, Malawi, the Maldives, Pakistan, Papua New Guinea, and Zambia, in an attempt to close this gap, the project partners stated.